It is with prayerful consideration, discussion, and excitement that we are pleased to announce the launch of the "Clearly Seeing 2020" capital campaign! The goal of this campaign is to eliminate our church's debt, enabling us to better execute our vision of Follow. Connect. Make. With our debt removed, we're more easily able to Follow Jesus without distraction. With our debt removed, we are better able to Connect with others through ministries of the church that will have increased financial resources. With our debt removed, we are better able to Make disciples through our missionaries and ministries. What does the theme "Clearly Seeing 2020" mean? Being encumbered by debt is like going through life with poor vision, or with dirty glasses. We can function, but not at optimal capability. The goal of the campaign is to eliminate the mortgage debt, and to update aspects of our church campus that have been falling by the wayside for many years. This will provide our church with a clean slate in 2020 to face the next decade with no debt burden, free to follow the leading of the Holy Spirit in our church's mission! Generous givers prayerfully scan their surroundings to discern where God is working and where they can invest around their passions. Furthermore, it is in the middle of generosity that God can be found. God is a giver (Deuteronomy 26:1): He gave His only son (John 3:16); He gives daily bread (Proverbs 30:8); He gives eternal life (John 10:28). The optimal opportunity for the godly, generous giver has Christ at the core because they understand the long-term solution to life is the Lord. Money can muster short-term results, but ongoing life change will only happen when Jesus is at the heart. Finances without faith in Christ provide a temporary solution at best. Where He is preeminent, He sustains the work. Indeed, the fruit of your thanksgiving to God tells the generous giver they are investing in the right environment. So remember, gratitude to God follows generosity. Why are we beginning a capital campaign in the fall? Have you noticed the growth in people attending worship services, serving in ministries, coming to faith in Christ, getting baptized, and tithing? After several months of prayer and discussion, the elders believe that God is preparing our church for a new season of ministry. We believe that "Clearly Seeing 2020" is an obedient response to His leading. What are the goals of "Clearly Seeing 2020"? Desiring to be obedient to the Lord and to "owe nothing to anyone except to love one another" (Romans 13:8), we desire to eliminate our church's $2 million debt. For several years, our leaders have ministered under the weight of this debt. Without it they will be able to lead, enable, and equip their ministries as they have long desired to do. Another vision of the capital campaign is to provide debt-free maintenance and refurbishing of our facilities for a new season of ministry. 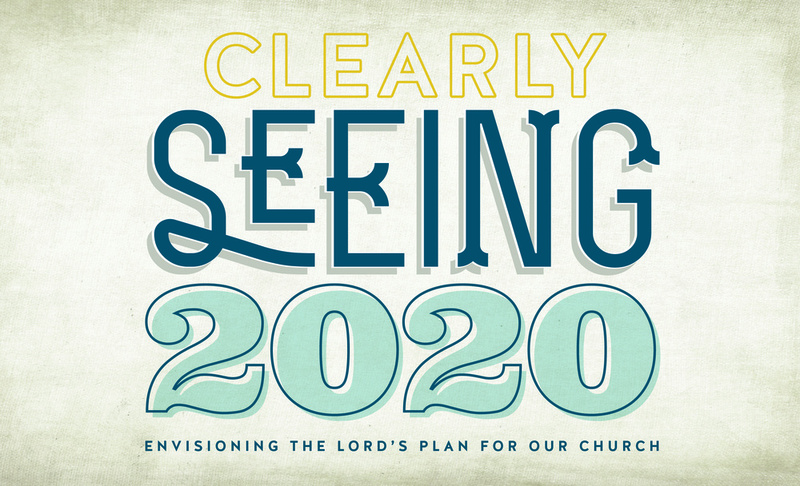 How does "Clearly Seeing 2020" fit our church's mission to Follow, Connect, Make? We will FOLLOW Christ by being good stewards of what He has blessed us with. "Clearly Seeing 2020" frees us from debt, allowing us to redirect funds to equip our pastors, staff, and lay leaders to run their ministries as they have long-desired to do. We will tithe a portion of the campaign to local and international missions. "Clearly Seeing 2020" enables us to CONNECT with one another by improving our church campus to drive the next 20 years of ministry. Lastly, "Clearly Seeing 2020" empowers us to MAKE disciples of all nations by providing resources. We prayerfully hope to launch six new missionaries/families from within our congregation and significantly reduce the cost of short-term mission's trips for our members and youth. the button above to join our prayer team. Thank you for your question! The campaign committee will answer it as soon as possible and post it to our site, as well as email you a response.